Every broker should have a scorecard made up to evaluate carriers and even individual drivers. It only makes sense. Knowing who is working for you and with you is good as well as who is working against you and not with you. See, I told you - you don't have to run a big brokerage or be a graduate from the Wharton School of Finance. The relatively new Hours of Service (HOS) is putting everyone in a bind on some occasions. It would behoove a freight broker to get fairly acquainted with some of these regulations. A quick example is when a driver enters a facility for delivery and he/she is running out of hours, So, after delivery, he needs to move on but the questions is, "Where do I go, I out of hours?" There are some exceptions in cases of emergency but there may also be some confusion in defining what is an emergency, etc. Lower Diesel Fuel Prices ... they can "Make You", not "Break You"
This is important. Over the past ten years or so, high diesel fuel prices have been a big factor resulting in the demise of many trucking companies. After all, trucking companies are asset heavy with huge capital expenditures. So, capital outlays plus high diesel fuel costs have taken their toll. But diesel prices have dropped. What does this mean other than just being able to run the business less costly? Let's say that the average price per gallon of diesel fuel has dropped $1 over the past several years. For a truck driving 120,000 miles and averaging 6.5 mpg, that's a savings of $18,462. This is significant. So, lower fuel prices can actually help you "make it" as a trucker and if you want to get another good kick, consider becoming a freight broker and cut out the middle man. This move can also save you tens of thousands of dollars a year. Lower fuel cost, becoming a broker - a winning combination. 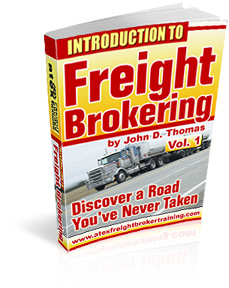 As a new freight broker, you are at the beginning of a long journey of learning. One particular area that you will focus on will be "finding trucks". At times it may seem as if you are trying to corral a room full of cats. They just keep wandering off in another direction. But you will learn from experience (if you are smart and monitor your activity) and you will find good resources to help you work smart. And, in our training, we provide a few other strategies to get and keep truckers. Every truck owner regardless of size should know in detail how much per mile it costs to run a truck or a fleet of trucks. Does the broker need to know what a trucker's cost is? Well, not exactly. The broker tenders a load to the trucker and it is up to the trucker to accept or decline. The broker will be looking at his or her margin to decide if a load is worthwhile for them. So, the trucker looks at the cost per mile and the broker looks at their margin. With time and experience both the trucker and the broker learn which lanes and which shippers are providing rates that are competitively priced. Sometimes you have to walk away; sometimes you have to take less than the desired rate. But neither the truck nor the broker can consistantly take loads that do not meet at least the minimum required rate. Do you know what the average cost per mile is for a commercial truck? Do you know what is the most costly type of expense for a trucker (other than having it sit idle)? Give this your best shot. I'll reveal the answer in another post. as some people make it out to be. into brokering. And this is okay. portation (for the trucking company). Yes, two separate MC#s and authorities. and pick up the cargo and make delivery. invoice your brokerage for the haul. We are actually heading to a driverless society. Even trucks will convert to driverless vehicles that will move cargo over greater distances and do it faster than with human beings. We are not talking about some fantasy that may happen many years in the future. Some driverless cars will be on sale in 2020 - that's less than seven years away. Now I wonder who the "bears" will be picking on when this switchover happens. There will certainly be some frustration here. Hey, how about some recognition? I train a lot of individuals that happen to own trucks. When I talk about giving proper recognition to drivers that do well for you, these individuals quickly identify with this. As a broker, you may have any number of drivers that are busting their butts off for you. Why? Because they are dedicated professionals and they take pride in the quality of their work. If you are not rewarding these drivers or at least giving some recognition, you are missing the boat (or the truck?). You can monitor your drivers on whatever you think is important: on-time pick-ups and deliverys, call-ins when loaded and when empty, following instructions, being available, evidence of working proactively, etc., etc. Maybe some type of cash bonus would be in order. Treat yourself by treating your drivers. Both you and the driver will benefit. "I've been driving a truck for 15 years and have worked with brokers. But I really don't know what they do or how they work." I can help. I'll show you how to broker freight and do it from the perspective of a freight broker. There are some big differences even though they may be two peas in a pod.